It’s been a month since Devon’s first ride on the FLO 60s. 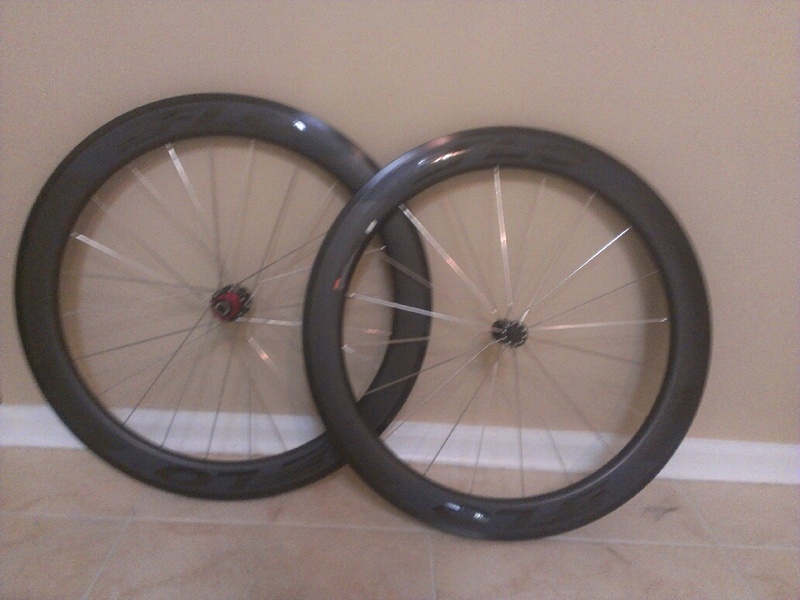 And since that time, both Devon and Mike have had the opportunity to put quite a few miles on this wheelset. Overall, both of them couldn’t be happier. While this might spoil the rest of the review, we’ll say right now that this is an absolutely terrific wheelset (even before you take into account that you can get the entire set for under a grand, $898 to be exact). Flo Cycling’s belief is that you should be able to buy a great aero wheelset without selling your first born. To do this, the guys at Flo crafted a wheel with an aluminum brake track (no, this is not always a bad thing) and attached carbon fiber toroidal fairing around it. And as a side note, Flo uses hubs that spin far better than the price of these wheels should even deem possible. To design the fairing, they made use of Computational Fluid Dynamic (CFD) modeling to avoid the cost and complexity of using a wind tunnel. Using CFD allows a company to create a design, test it, and then refine and retest in hours instead of days. Additionally, CFD allowed Flo to simulate an infinite number of wind speeds and yaw angles to create the shape they felt was best suited for their customers—at a cost far below what its competitors spent (a savings passed on the customer). The end result is one heck of a wheel. In many ways, riding this wheelset is extremely reminiscent of riding a set of 404 FireCrests. They are extremely fast (Mike set a new PR on his 20 mile TT route) and exceptionally stable (laughing in the face of cross winds). The wide width of these wheels lends to an incredible road feel, as well as providing stability and less rolling resistance. Riders will know the wind is there but will not have to fight it to stay in control. Instead, you can get into a deep TT tuck and punish your legs through the miles. These are the type of wheels that genuinely make a rider faster—and for just $898—have truly earned the name “free speed.” To put that price in perspective, for the retail cost of a single set of 404 FCs ($2,725) you can get a Flo 60 Front, Flo 60 Rear, Flo 90 Front, Flo 90 Rear, and a Flo Disc (total: $2,395) and still have money left over to buy Continental GP4000s for the whole lineup. When riding these wheels you’ll also experience a benefit you may have missed with other carbon wheelsets—sudden deceleration (A.K.A. braking power). While the majority of the transition area has moved toward full-carbon wheels, it’s easy to forget that braking on an aluminum track will outperform carbon. The Flos did not disappoint. They stop like you have a grappling hook attached to your seat stays. This is something that we had sincerely missed when we were tucked deep into our aero bars and needed to panic stop. The 60s brought it all back. Additionally, with an aluminum brake track you need not worry about warping or power loss due to heat buildup. We also need to mention the strength of these wheels. There is an unmistakable feeling of solidity throughout the Flo 60. These aren’t your typical super wheels, which fly down the tarmac but snap when your “I’ll-have-the-foot-long chili-dog” buddy looks in their direction. Instead, the Flos are your dependable workhorse with speed to spare. The wheelset we were given to review was the standard non-Clydesdale version, and Mike’s 200-pound frame (the upper boundary of Flos standard wheels) caused no issues with the wheelset. Here at AG we love quality and dependability in a product, and these wheels match that description perfectly. The one downside to the 60s is the weight. 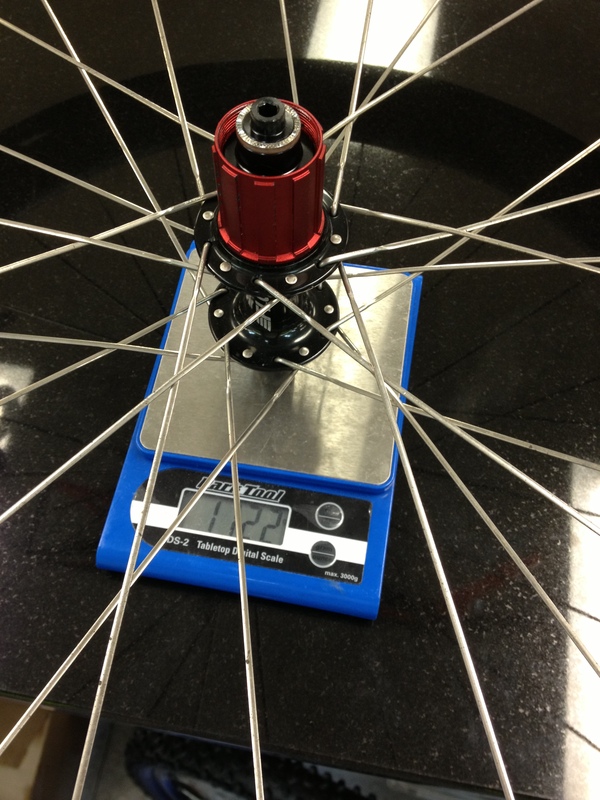 The wheelset measured in at 2049g, including rim tape. Unfortunately, lightweight wheels these are not. However, we can honestly say that this was not a problem for the vast majority of riding during our test period. However, Devon did notice in his early rides that climbing may be an issue with this wheelset. To that end, Mike performed our standard climbing test on his final day of testing. 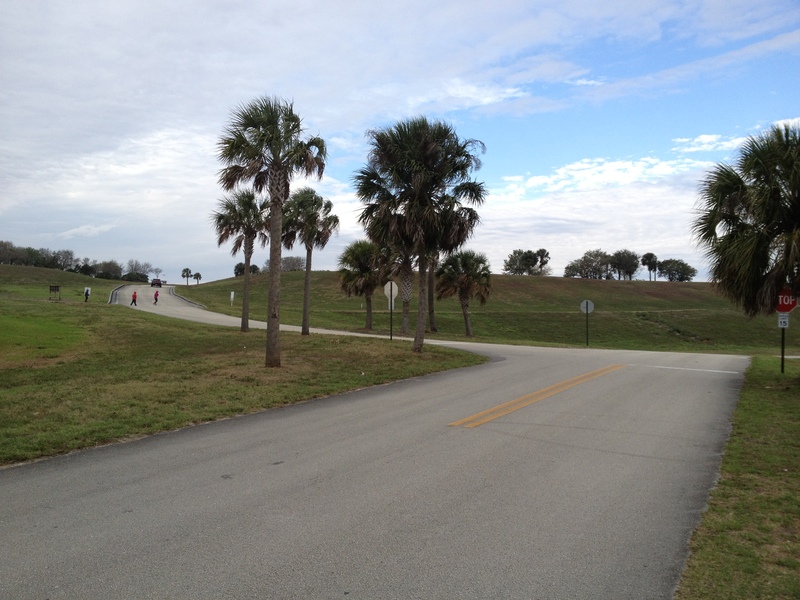 If you have ever ventured down to sunny South Florida you’ll notice that one of the geological features missing here is hills. In fact we have only two kinds of hills—highway overpasses and converted garbage dumps. Strangely, the AG staff prefers to do our hill workouts on the latter. Our local converted garbage dump is absolutely perfect for interval hill workouts. There is a 1/4 mile flat run-up to the hill where you simulate coming out of a U-turn and instantaneously accelerate up to race pace. This is followed by a hard 135-degree turn (where you lose most of your speed) back to a short ¼-mile climb at a max grade of 9%. (Note: If any of our local readers would like to join us on one of these workouts we’d love to have the company). Since this course emphasizes climbing ability as well as 5-20mph acceleration, this was a test designed to reward lighter wheels and to find fault with heavier wheels. So how did they 60s do? They were a little troublesome to get to speed coming out of the U-turn, but once they were going, they wanted to just keep going harder and harder. And thanks to the strong braking surface, you could wait until the very last moment to brake for the 135-degree turn. Unfortunately that did mean that you hit that hill with almost zero forward momentum and had to haul the wheels up the hill (yes, you can feel that weight). But would that stop us from buying the wheels? Absolutely not. Again, this was a test meant to simulate worst-case scenarios for a wheelset, and as Devon said in his first-look article, climbing wheels these are not. The only other complaint that Mike had about these wheels was something that Devon actually found appealing. Devon described the wheel noise as “the bike sounding as if it’s powered by dilithium crystals at 30mph.” Mike simply recalled it as a whistle. After one hundred miles or so you tend to get used to it, but it does catch you by surprise the first time you hear it. I am sure anyone that has made it this far into the review will recognize that we were smitten with this wheelset. We recognize that as far as wheelsets go, it wasn’t perfect, but it was very close. On top of that, when you consider just what an amazing bargain you’re getting, it’s extremely hard to find a reason not to pick up a set. As Devon said in his first article, affordable aero is about being fast without a second mortgage. And in just about every way the Flo 60s are the epitome of that credo. Love your reviews;) keep them coming. Thanks Kelli. Make sure you are following us on Facebook and Twitter to keep up with the latest info. Thanks for your review guys. I may not ride a TT bike, but I feel your reviews and technical explenations help me get the most out of my road bike. Keep up the great work! We appreciated the compliments Stephen. We here at AeroGeeks are extremely proud of what we have accomplished in the past six month, but we are most proud of all the great feedback we have received. Remember that our favorite articles and reviews are based on user feedback so if you ever want to see something on our pages just reach out and let us know! Is that Vista view park? Where do you guys normally ride? Yep – we do the majority of our riding in Weston. 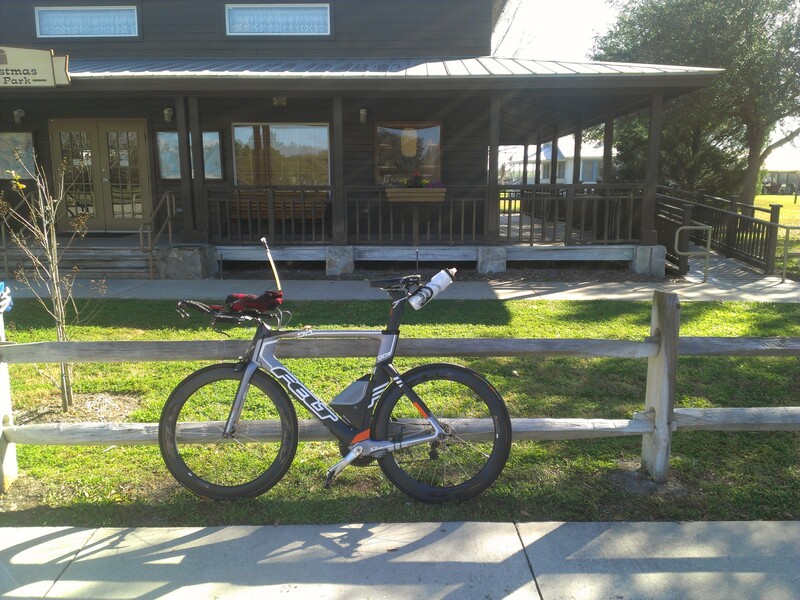 We have some good 20 and 30 mile loops that we use for mileage and interval training. We also like to hit Vista View to get our hill repeats in. In fact Mike and Devon were our at Vista View this past Saturday doing a workout. Makes me want to sell my 7 month old Hed Jet 6/9 combo, buy new wheels, and keep the difference. What size tires can be installed on the Flo 30s? Interesting review guys. I purchased a Flo front 60 and a rear 90. I have test ridden these wheels about 8 times. In a very slight cross wind, I found the front wheel to handle very poorly and I have ended up off the road in a ditch twice. I am a 150lb lady and a pretty strong rider, but I found the front 60 to be the worst performing wheel in a slight wind that I have ever ridden. 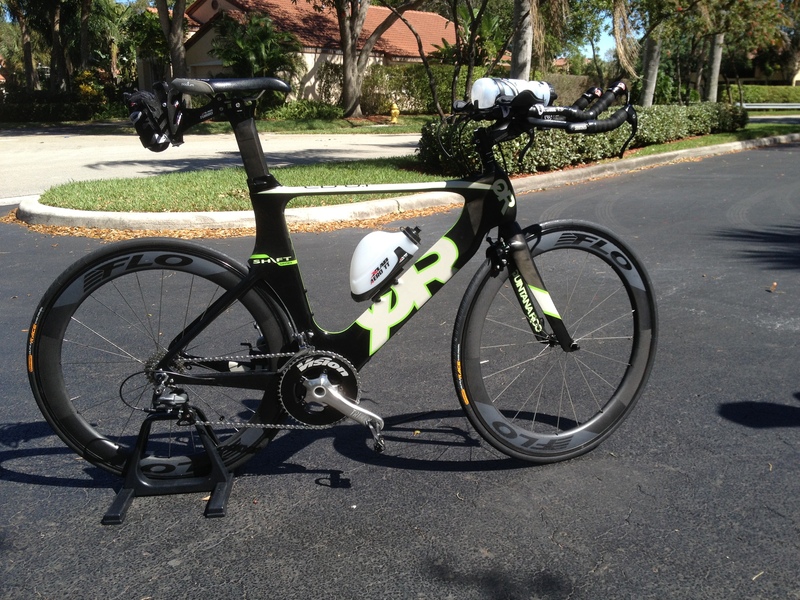 My front Zipp 808 handles much better in the wind! Given my experiences, the 60 seems to have very limited utility. I wonder how the 30 handles. Anyone know? This is Chris from FLO. I have to say this is the first we have ever heard of anyone having issues in wind with our front FLO 60. I was wondering if you would give me a call to talk about your wheel. My phone number is 702-529-4744. I want to better understand the situation. So what was the verdict on the wind issues with the FLO 60’s? This is also the first negative review I have seen on the FLO 60’s but I am planning on getting FLO 30 and 60 wheelsets in the near future and would like to know if this really is a problem or a special circumstance. Also, if there is a rare defect (possibly in this case) are there warranties on these and some kind of return policy? All honest and informative information will be greatly appreciative. For what it’s worth I never heard from Kiwi, even after offering her my phone number. We stand behind our products 100% and offer a warranty that can be seen on our website http://www.flocycling.com/warranty.php. In my opinion the comment above is a special circumstance or a troll. I honestly cannot fully understand the problem since the person making the claim never contacted me. Stating that a “defect” would cause handling issues would be quite a stretch. That’s because our wheels come out of a mold and all have very tight tolerances. The way a wheel handles in the wind has everything to do with it’s shape. Since the wheels all are the same shape, a defect really can’t cause this. If the shape was that far off, it wouldn’t even make it off of the production floor. Defects are issues with the carbon aluminum bond, or a mechanical flaw in the hub. These happen very rarely, but when they do, we fix them. Please feel free to ask any additional questions should you have them. You too are free to call me at 702-529-4744 if you like. Ya, I was a bit surprised at Kiwi’s comment. Weight has been the only negative I’ve ever read about until this. I love what y’all are doing at FLO bringing quality and budget into this sometimes snobby/overpriced sport. I want to support FLO with all my heart but like many amateurs my budget has a strong pull on my decision. I am looking for a wheelset to ride for years. If all these good reviews/tests keep coming in I will definitely be jumping on the FLO-Jo and prolly getting a few sets of wheels over the years. Hope y’all’s product matches the hype because it’s looking good! Also, I would call but I’m stationed in Korea right now then off to Italy! Hope to get a hand in an order once I’m ready to buy! Thanks for the kind words Mark. You’ve mentioned weight a few times. 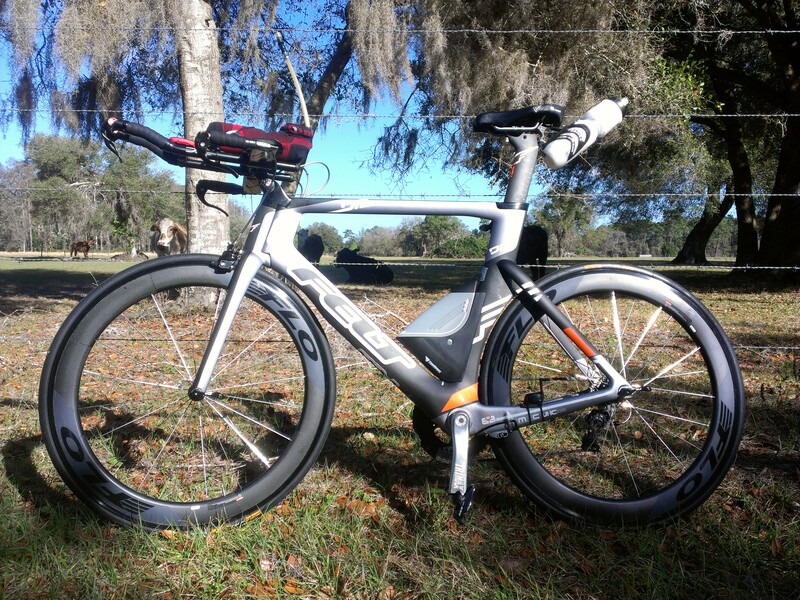 Have you seen some of our latest blog articles discussing aero vs. weight? It might surprise you how little the effect of weight can be. Thanks Les. I’m a little confused by your message. It says when I look at your site in Ie (I’m guessing Ie stands for Internet explorer) you say it looks fine. Then you say when you open it in Internet explorer it isn’t fine. Can I ask again what browser you are having issues with? Also what version of that browser is causing the issues? I was googling reviews on the P3 and happened to come across your website regarding all the Cervelo models. I thought your website was very informative , detailed, and your expert advise about other products regarding triathlon gears was on point. You guys are awesome. Thx for saving my time from further research. Thanks Roger! We love getting the chance to test all of these great products. Let us know if there is anything you would like to see on our pages. We have a lot of great stuff in the pipeline but we are always looking for new ideas! 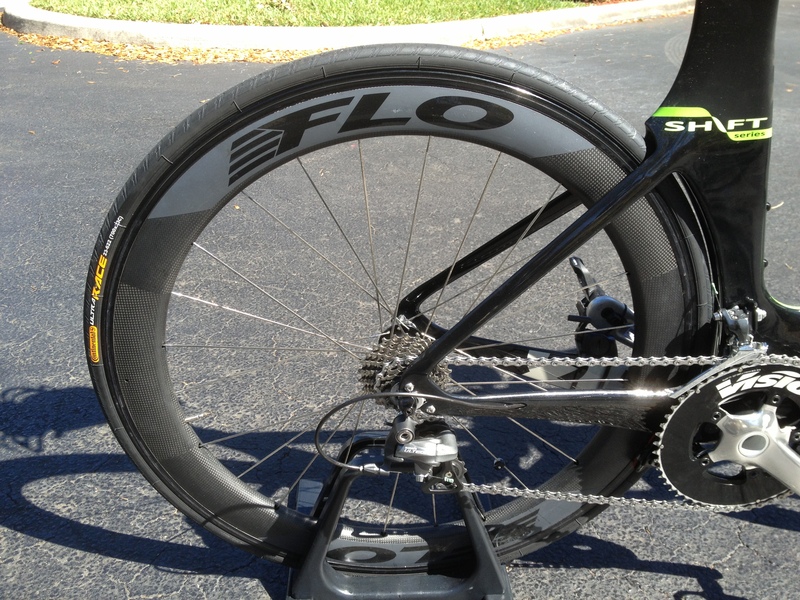 The wheels of flo cycling are very good, allready bought the 60’s (front and rear) and the disc. unfortunatly, i had to pay an antidumping tax on the flo disc. since the wheels are manufactured in taiwan and imported into the EU, the anti dumping tax was applicable. (it does not matter that the disc was sent from the US, the origin of the goods = Taiwan, so the anti dumping tax was applicable). my 699usd (ceramic bearing) disc ended up to be a wheel of 1200 eur. I had contact with one of the 2 owners a few times, he was very easy to contact and very friendly, but they were also not able to help me with this issue. I ended up with paying 240 EUR taxes on the 60’s (which is what i expected), which makes this wheelset price/quality very good. I ended up paying 620 EUR taxes (535 anti dumping + 85 recalculation fee) on the disc (400 more than expected). If I knew the flo disc would cost me 1200 EUR, i wouldn’t have bought it. I eventually paid the anti dumping tax as i allready had paid for the transport (79 usd if i remember well) and i had to pay a fine of 85 eur to customs as i requested a recalculation (as i was told the 535 eur anti dumping tax was not correct). Be aware, living in the EU may result in this anti dumping tax on flo wheels. the tax is correct, but not always requested. I guess it’s just having luck. Where is the converted garbage dump that appears on the picture? David this is i Broward County, Florida – I75 and Griffin Road. I love my Flo Wheels. Ride the 60 in front and disk in back for ultras. I see a consistent jump in speed vs. power output when I move from my trainers to this set-up. Feels like have been swinging a heavier bat and move to lighter one for races. The 60’s ARE durable enough for everyday training, I just choose not to. BTW have you all considered making your paragraph font bigger. 14 is the new 12, or in this case 11 or 10. All the cool guys are going with larger font.